This is the second of an exciting two-part conversation with Sir Lloyd Geering. He is a radical theologian from New Zealand. He was tried for heresy in 1967 and his life and theological contributions have been noted in the film, The Last Western Heretic. He is the author of over 15 books including, Christianity Without God, Coming Back to Earth: From gods to God to Gaia, and Tomorrow’s God: How We Create our Worlds. 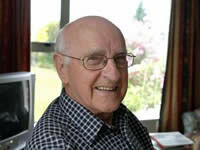 He is going strong at 95 and has just published his latest book, From the Big Bang to God. It is now available from Polebridge Press. He speaks with me about that book and his theological journey. Thursday, June 27th at 8 pm on WETS, 89.5. Sunday, June 30th at noon on WEHC, 90.7. Sunday, June 30th at 2 pm on WETS, 89.5. Monday, July 1st 1 pm on WEHC, 90.7. Wednesday, July 3rd at 6:30 pm on WEHC, 90.7.